Surreal random micro:bit story printer | Blog My Wiki! This is a slight twist on my original Little Box of Poems I originally made back in 2012. It mashes that up with Papert-inspired random poetry to create surreal haiku-like poems or story starters. This project uses a BBC micro:bit and a serial thermal printer. 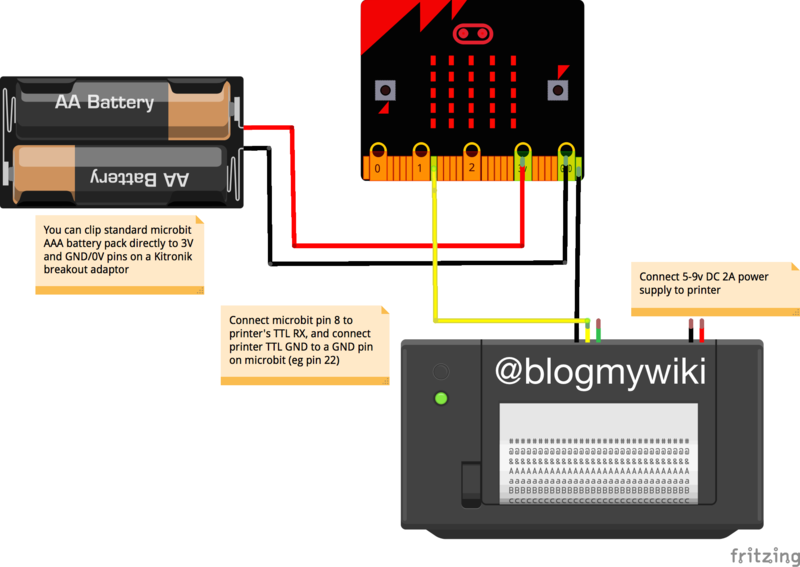 Wiring it up is very simple: connect the black data wire on the printer to GND on the micro:bit, and the printer’s yellow data RX wire to pin 8 on the micro:bit (you could use another pin, I just happened to use pin 8). The printer needs 5 volts to power it, so it needs a separate power supply. Luckily USB sockets give 5v, and thanks to this tutorial from the awesome Tanya Fish I chopped up an old unwanted USB lead to make my own source of printer power. micro:bit with power source, battery or USB. Some way of connecting pins – edge connector and jumper wires or crocodile clip leads. A serial thermal till-roll printer like this one and some thermal paper. A 5v power source for the printer – an old USB lead chopped up and a USB power source will do nicely. Python program below and here – you can flash it onto the micro:bit using the online micro:bit Python editor or Mu. The Python program is in two parts – the first part is all the functions to send control codes for different styles of printing – most of these aren’t used in this project but you might have fun playing with them – you can also print different kinds of barcode if you look here. The second part creates lists of different kinds of words: animal / people nouns, verbs, adverbs, prepositions, adjectives and place nouns. Each time you press button A, it picks a random word from each category and prints them out. You could use this as a story starter, use it as a passphrase or just enjoy the surreal haiku-like poems. Add your own words. How long a story can you get a machine to write? Let me know what you do with this idea, using a printer, 2-line LCD or just the built-in LED display. # newline (\n) character to empty buffer & print. # This enables mixed print modes on same line. p.s. I’ve tried printing bitmaps from the micro:bit with no luck, but this article may offer a clue. This entry was posted in microbit and tagged Microbit, printer, Python. Bookmark the permalink.